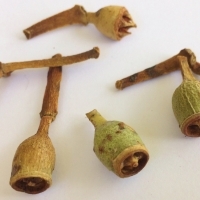 Has reddish brown, stringy bark, persisting to the smaller branches. Red mahogany is well regarded for its high quality timber, being very hard, heavy, and having dark-red heartwood. A dark trunked forest tree with grey furrowed bark. When in flower, the nectar is attractive to birds and insects, and is used in honey production. An erect tree with hard deeply furrowed black persistent bark and narrowed drooping leaves. One of the important commercial timbers of Qld with hard reddish durable timber used for heavy construction. 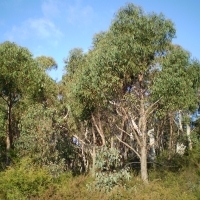 A slower growing eucalypt. This tall tree is often found on the edge of rainforests. It has soft, fibrous, orange bark and a dense crown. 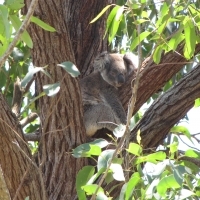 Tallowwood is so named due to the greasy feel of the wood when cut, and is a known koala feed tree. 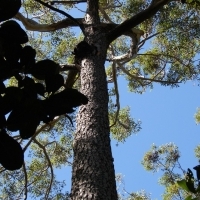 A beautiful tall, elegant tree, 35 m or so high, with a tall, straight cylindrical trunk. Prized for the strength and durability of their timber. The bark sheds to the ground, there is no collar. Koala tree. This fast growing, elegant gum is valuable in plantation forestry. The white bark is often rough at base and smooth above. Favours hill slope locations and warm humid conditions. Natural distribution along the coast and nearby ranges of New South Wales and Queensland. Gympie messmate is an important commercial wood products tree in Queensland that produces high quality, strong, extremely durable and attractive timber. Although only small volumes are harvested from native forests in Queensland, it has a well-established market, and is in demand nationally. Gympie messmate timber from native forest has been used for a range of construction, engineering, appearance products and round timbers. Well regarded for the high quality of timber. Somewhat similar to tallowwood but not as greasy. The wood is resistant to termites. 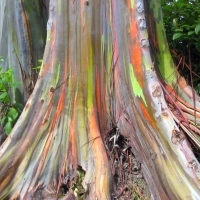 The unique multi-coloured bark is the most distinctive feature of the tree. Patches of outer bark are shed annually at different times, showing a bright green inner bark. This then darkens and matures to give blue, purple, orange and then maroon tones. This is a tall tropical tree to 60m native to the northern hemisphere. 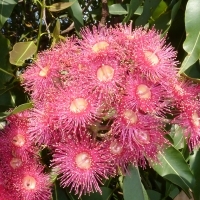 Very frost sensitive the Rainbow Gum is only suitable to large gardens or parks in the tropics or subtropics, it will prefer a site where the temperature does not dip below 15 degrees. The complex essential oil is distilled from the leaves and used for flavouring and aromatherapy. 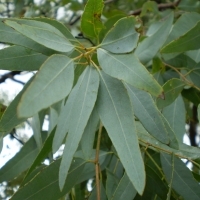 The whole leaf is also used as a bushfood spice and herb-tea ingredient. It is used like a bay-leaf in savoury cooking, and is also used in confectionery and teas. It has a fruity-lemon flavour, with a rosemary-like edge. 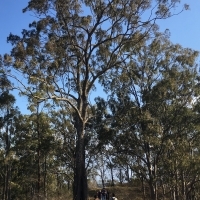 A small rough barked sclerophyll tree that grows naturally in pure stands on hills in the Palmer River region of Cape York. 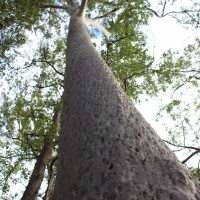 Identified by the stocking of rough bark, to about halfway up the trunk, above this is white smooth bark. 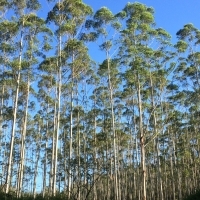 Economically, it is one of Australia's most important hardwoods. Koala food tree. 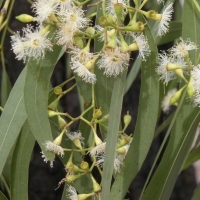 It grows as a small to medium tree from 5 to 18 m high with a spreading crown of 5 to 15 m. The short trunk is often bent and has smooth grey to white powdery bark. Freshly-exposed new bark is pink. A strong-growing, tough tree that does well in poor swampy or salty soil; also adaptable to a dry climate. The leaves are a very dark green, the bark is dark and rough, and pink flowers are produced in copious quantities. One of the noblest of the large eucalypts. Originates from high rainfall regions of Aust. Can reach up to 60m. 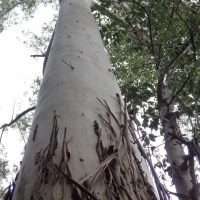 Smooth whitish or blue-grey bark. Clusters of white blossoms. Plunkett Mallee. 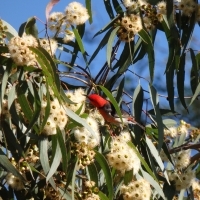 Small slender tree with a mallee habit. Grey green adult foliage. Showy white flowers Oct-Jan. Adapts to most soils in a warm site. Protect from frost while young. This species has some of the largest leaves among the eucalypts. Showy flowers are borne in pendent panicles and range from white or pink, apricot or red. Large ribbed seed capsules follow. 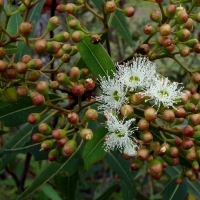 A tall spreading gum, native to North Eastern NSW. The bark is shed in long strips revealing a smooth white bark, but is often scaly and corky at the trunk base. Highly recommended for quick growing forestry plantations.